We host field trips to the studio. We can accommodate up to 50 students at a time if you provide 1 chaperone per 10 children. Students can paint a 6 X 6 tile and learn about how pottery is glazed and fired. We have a certified Reading Specialist on staff to provide Literacy Nights for Parents and Students at your school or in the studio. We pair a fiction and non-fiction text with a pottery piece to provide a Common Core State Standard focused lesson for parents to use at home. Listen to a story and paint while you improve your reading! We will pair up with your PTO and provide a great place for students and families to raise money for your next cause! Join us for an evening of relaxing paint therapy. Bring your own beverages and snacks and leave the kids at home. Enjoy a fun and creative night out with friends. $8.00 studio fee plus the price of pottery you choose. Thursday nights from 7-11PM. Upcoming dates: September 20, October 18, November 8, December 13, January 17, and February 7, March 14, April 25, May 16, June 13. This is an RSVP only event. Please RSVP here. Looking for a fun evening out for the whole family? Bring the kids in to watch a movie and paint while you head out for the evening. Friday nights from 7-9:30 PM. $20.00 for 1 child, $5.00 for each additional child. This is a great opportunity to get some holiday shopping in! ​Upcoming dates: October 26, November 30, December 21, January 25, and February15. ​ This is an RSVP only event. Please RSVP here. 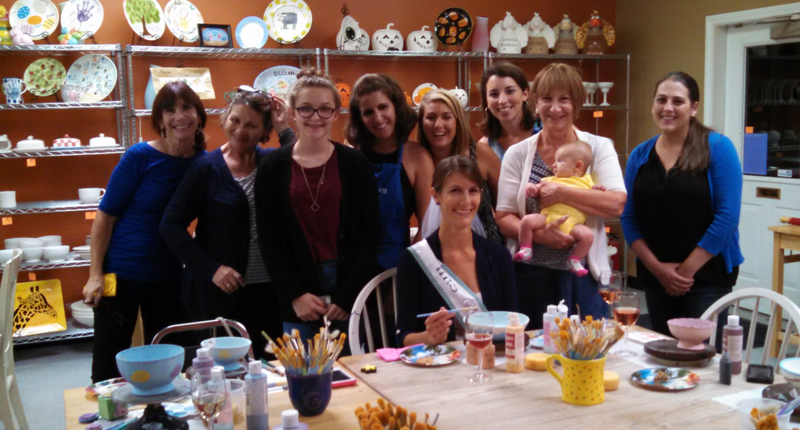 Plan a special trip to Pottery Playce and you will always remember your studio time together painting and creating memories. You can wear your pajamas and we'll make the coffee! A wonderful opportunity to create a one-of-a-kind gift for a parent, grandparent, friend or teacher. Sunday mornings 9-11AM--Schedule yours today!